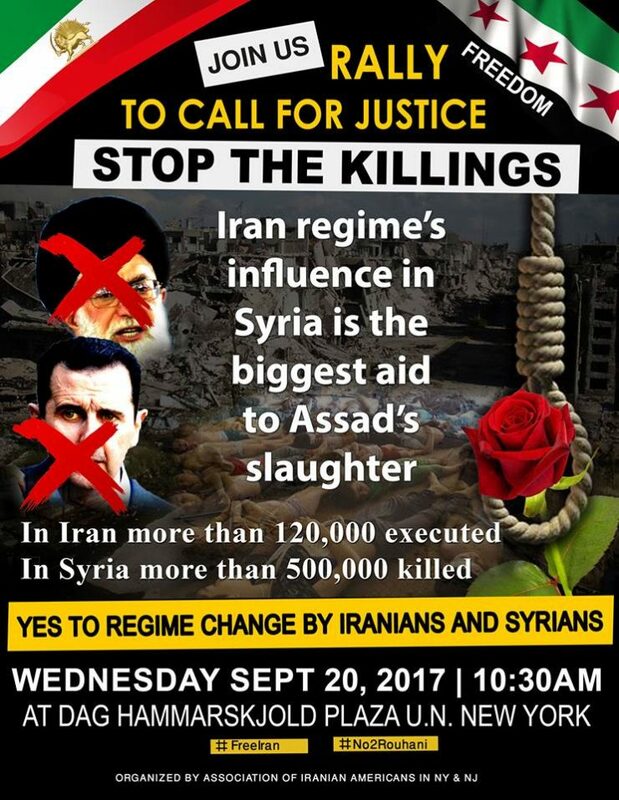 Iranian and Syrian activists and American non-profit organizations invite those who are frustrated with the lack of human rights for Iranians and Syrians to join in support of the “Free Syrian & Iran Rally.” Scheduled for Wednesday, September 20, 2017 outside the United Nations Headquarters in New York City, the rally will take place during general assembly meetings. The gathering will bring thousands to the U.N. Headquarters, against the backdrop of increasing executions in Iran and indiscriminate killings in Syria. This year’s rally coincides with shocking new revelations regarding the 1988 massacre of some 30,000 political prisoners in Iran, and proves that the Syrian regime used chemical weapons against Syrians. We are waiting for YOU, the people need YOUR voice. We need freedom and democracy!